The Nikon Monarch Binocular Tripod Adaptor allows you to easily mount your Monarch, Action, and Action Extreme binoculars, and any other binocular with a 1/4"-20 threaded socket, onto a photo/video/field tripod for hands-free use. The base of the adapter has a 1/4"-20 mount to be compatible with a wide variety of support systems. Using your binoculars, especially high-power ones, or those with large objective lenses helps to steady the view, reduce vibrations, and eliminate arm fatigue. Box Dimensions (LxWxH) 8.05 x 3.55 x 2.25"
Monarch Binocular Tripod Adaptor is rated 4.5 out of 5 by 28. Rated 5 out of 5 by Anonymous from Solid Adapter This is a solid but lightweight adapter that works perfectly not only on Nikon binoculars but any binoculars with a standard 1/4-20 threaded socket between the two objective lenses. I'm using this adapter successfully with my Pentax 10x50 PCF WP II binoculars.This will interest only a minority of people but I use a ballhead with a quick-release mechanism on my tripod. I've mounted a flat quick release plate on the bottom of the Nikon tripod adapter so that I can rapidly switch between having my camera vs my binoculars on the tripod. The Nikon tripod mount has a standard (1/4-20) thread so you should be able to do this whatever brand/type of quick-release plate you use on your cameras. Rated 3 out of 5 by Orlando from Doesn't Tighten Enough The adapter does not tighten enough causing the binoculars to move and therefore it never really holds them steady, despite it having a washer attached. I plan to add another washer to see if that will help hold the binoculars better. It is made well, but given that I own small binoculars- the 10x42 Monarch 5, I can't see this working well for anyone using anything heavier (unless another washer helps). I gave it 3 stars because I don't think I should have to modify something that should work well with the same brand. Rated 5 out of 5 by Not-the-cat from Unanticipated uses for this thing This adapter is great. I use it attached to a monopod. It allows me a relaxed view through my porro-prism binocualars that are 10x and in need a steady hand. They have also allowed me to pretend I've got a 600mm telephoto camera lens. I just hold my camera phone, a Blackberry, to the rubber cup of the binos after focusing, and snap. Without fixing the binoculars to something steady via this adapter, such an opperation would be very difficult, if not impossible. Next purchase will probably be a tripod to free up the second hand that is quickly becoming occupied with wildlife cameraphone photography. Rated 5 out of 5 by Joel L. from Handy accessory This is an inexpensive little accessory which is easy to carry and use. It is sturdy and well made. It fits the common photographic tripod and I have used a similar one with 15x70 binoculars. Great for binoculars that are just abit too heavy to hold hold steadily or for viewing fixed or slow moving objects. Rated 4 out of 5 by Anonymous from Steady and strong for easy viewing I have my Nikon Action Binoculars mounted with the Tripod Adapter on my standard tripod. It is so easy to release so I can swap with my camera. Much easier to focus and hold steady for those times when extended viewing is necessary. Easy to install and now I just leave it on all the time. Rated 5 out of 5 by Phil Boo from Works with Other Brands Purchased adapter to use with monopod with swival tilt head with quick release plate. Plan to swap binoculars and cameras on top of monopod during cruise land tour to Alaska. 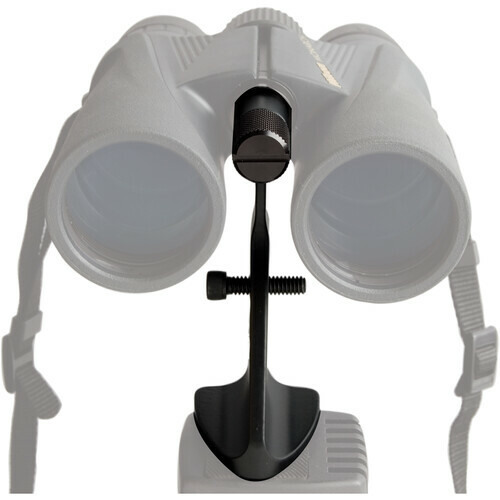 Fits non-Nikon binoculars and accommodates user with narrow inter pupil distance. Rated 4 out of 5 by Anonymous from holds my binoculars I use this with my 12x monarch binos and it works good. My only comment is that my wife and I have different spacing between are eyes so when moving the width of the binoculars back and forth it becomes loose. Rated 4 out of 5 by Anonymous from A great addition If you want to mount your Nikon on a tripod, this is a necessity. It is a bit awkward to mount to the binoculars since the space is very limited, but it only takes a minute or two. Is this compatible with Nikon 8x42 Monarch 5 (roof) binocular? I have a different model of Nikon so I cannot be sure. Where the middle pivot point is on mine there is a screw that can be removed and the mount goes there. I looked at a photo of yours and it looks that either you do not have this piece, or it is shaped differently. Sorry I could not be more help. Is this compatible with the Nikon 10x42 Prostaff 7S Binocular? I'm honestly not sure, I have Nikon Monarch 5, 20x56 and Nikon Monarch 7, 10x42 that it will fit. Sorry I couldn't give you a specific answer. Can anyone recommend an appropriate sized Arca type quick release plate? What are the dimensions of the base? Would one of the two Oben Arca type plates be sized better than the other? Is this compatible with Monarch 5 10 X 42 binoculars ? If so, when is it expected to be in stock ? Yes this Tripod Adapter will be compatible with the Monarch 5 Series. As of now there is no ETA Date in our system, but we do have them on order. So hopefully we will have them in soon. Are the same 8177 and 8178? It looks like the 8178 is a camouflage finish and the 8177 is black. Otherwise, apparently they are the same. What is the horizontal bolt through the vertical arm for? The horizontal bolt is an included &quot;alternative attachment method&quot;. It is an Allen screw in case there isn't room for the thumb screw.